Gene Mische leads the parade of riders at last year's American Invitational. Photos© Kenneth Kraus. 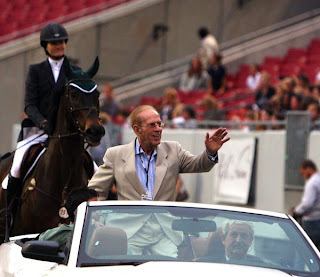 Tampa, FL - February 24, 2011 - The city of Tampa, Florida, will once again play host to one of the world's premiere show jumping event, as the $200,000 Gene Mische American Invitational, presented by G & C Farm, returns to Raymond James Stadium on Saturday, April 9, 2011 at 7:30 p.m.
Once again, the stellar event bears the name of the founder of the class, Stadium Jumping's legendary Gene Mische, who first brought the event to the Tampa Bay area in 1973. Mische died recently after a long and hard fought battle with cancer, but was thrilled to be able to witness last year's class before he passed away. In addition to G & C Farm, who returns for a second year as the presenting sponsor, Stadium Jumping welcomes Horsewares Ireland, Land Rover, Gold and Diamond Source, Morgan Stanley, Innisbrook Resort and Elizabeth Busch Burke, who have all generously come forward to join in the 2011 sponsorship of America's premier show jumping event. Over the years, the American Invitational has been recognized as the crown jewel of American show jumping, and year in and year out, has been one of its toughest tests. 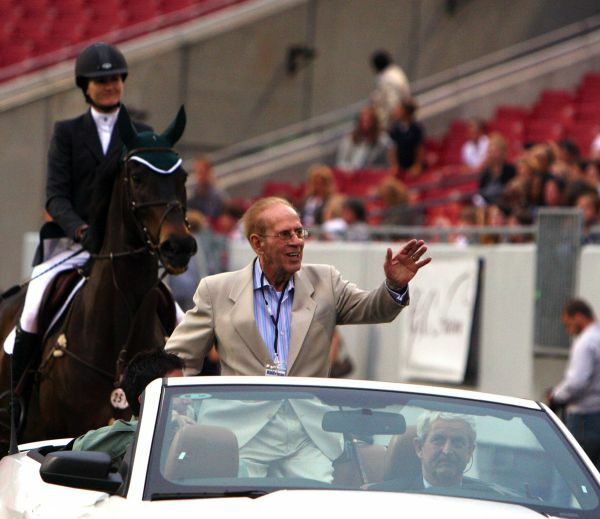 The $200,000 Gene Mische American Invitational, presented by G & C Farms, at Raymond James Stadium, often called the "Super Bowl of Show Jumping," brings together a star studded international group of equestrians to compete for one of the greatest titles in all of show jumping. The stakes will once again be high when show jumping excitement returns to Tampa Bay in March. According to Stadium Jumping's Michael Morrissey, there should be a great crowd on hand for this very popular Tampa Bay area event. "Ticket prices have been made more affordable and group sales have been marketed throughout the Tampa Bay area," Morrissey said. "The Gene Mische American Invitational, presented by G & C Farm, has always been a great production, and we're very, very excited that this year's event will be just that, a real show jumping event." The $200,000 Gene Mische American Invitational takes place on Saturday, April 9, 2011 at 7:30 p.m. The gates at Tampa's Raymond James Stadium open at 6:30 p.m. Included will be the always popular public course walk, during which the award winning Glee Show Choir from Tampa's King High School will perform. Prior to the event, parking lot #6 will open at 3:30 pm for a special Mane Event Party, featuring a JustWorld Horseless Horse Show hosted by Q105 radio's Nikki Cruz and the Q105 mobile station. Also on the evening agenda will be the elegant Parade of Breeds, a Segway demonstration of the course walk will take place and the Tampa Police Mounted Patrol Color Guard will be on hand as well. Just prior to the jump-off, there will be a special performance by Arabian Nights. Also featured that night will be the 2011 Show Jumping Hall of Fame Induction Ceremony and presentation of the USET Foundations Maxine Beard Award for Developing Riders in Grand Prix sports. Prizes will be awarded for the winning riders' cheering sections. Each section of the Stadium will be assigned a rider before the Parade of Riders, later, those sitting in winning section will receive a prize. For more information, call (800) 237-8924. Photo Credits: 1) Jeffery Welles and Armani, winners of the 2010 Gene Mische American Invitational, presented by G & C Farm. 2) Gene Mische leads the parade of riders at last year's American Invitational. Both photos© Kenneth Kraus. 3) Just World Horse Show photo, courtesy JustWorld International.